For the seventh straight day, protesters have taken to the streets of Cairo demanding President Hosni Mubarak step down and end his 30-year rule. 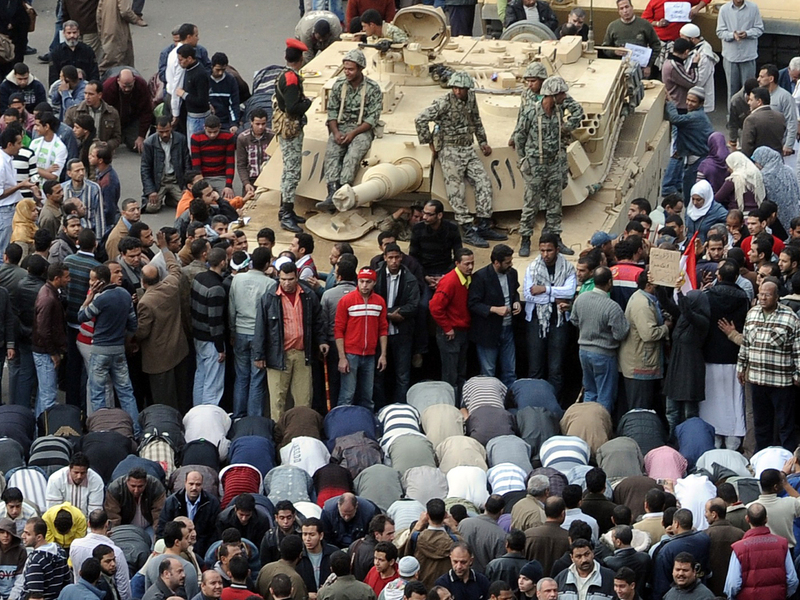 Our blog covers the latest news coming out of Cairo. 8:03 p.m. ET On the "CBS Evening News", Correspondent Mark Strassmann reports that, for better or for worse, the only police force Cairo has went back to work Monday: Hosni Mubarak's state police. Most people in Cairo despise the state police. They're seen as professional thugs and thieves, tools of the same corrupt state that has sparked this revolt. 8 p.m. ET On the "CBS Evening News", science and technology correspondent Daniel Sieberg reports how government cut off Internet service in Egypt. The Internet blackout was a surprising move for a nation previously known for being open, compared to other countries in the Mideast. 7:50 p.m. ET On the "CBS Evening News", Chief Foreign Correspondent Lara Logan reports that crowds of people overwhelmed airline officials at Cairo's international airport. Americans are being told to come to the airport with their passports and basically to get in line. They really have no idea where they're going. They can't plan in advance or make arrangements. There are a number of different destinations where there could be sent from Athens to Istanbul to Cyprus. 7:45 p.m. ET On the "CBS Evening News," Business Correspondent Anthony Mason reports the crisis in Egypt is adding a fear premium to the price of oil. Egypt itself is not a major oil producer, but Egypt's Suez Canal is a key oil transit route. Nearly two million barrels a day are shipped through the canal, and another one million move through the Sumed pipeline that also runs through the country. Any disruption there would divert tankers around the southern tip of Africa, a much longer and more expensive route. 7:37 p.m. ET On the "CBS Evening News", White House Correspondent Chip Reid reports the Obama administration is walking a very fine line about Egypt. On one hand they strongly support the rights of the protesters. On the other, the last thing they want is for Egypt to descend into chaos. 6:14 p.m. ET In advance of a major demonstration planned for Tuesday that organizers hope will attract a million people, Google announced that it collaborated with Twitter during the weekend to devise a workaround for protesters to get their message out in case cell phone service and Internet access is shut down in Egypt. Egyptians can call three international phone numbers on their hard lines and leave a message that will automatically be Tweeted out under the Twitter account @speak2tweet. The service is already live. While not all of the audio messages are in English, one female caller from Cairo said Internet access has already been shut down. "They did this before," the woman said. "The only difference is the last time when they did this I was completely freaked out. I was so scared they are going to shoot us all and nobody would know about it. This time, I'm not scared at all. I feel like- I want to tell them, 'Bring it on.'" 5:31 p.m. ET President Obama is not the only one trying to stay on the sidelines of the fray, CBS News foreign affairs analyst Pamela Falk writes. Presidential statements against violence often emanate from the U.N. Security Council. But the U.N. seems a bit tongue-tied on the Egypt crisis, even with decades of Middle East dealings under its belt. 5:16 p.m. ET The U.S. national soccer team has canceled its Feb. 9 match against Egypt in Cairo because of the political turmoil in the north African country, the Associated Press reports. U.S. Soccer Federation president Sunil Gulati said Monday that "due to the current situation all parties agreed it was best to cancel the match." The game against the Egyptian national team had been announced on Dec. 13. The next game for the U.S. team will be March 26 against Argentina at East Rutherford, N.J.
4:43 p.m. ET CBSNews.com's "Washington Unplugged" held a roundtable discussion on the situation in Egypt with Robert Danin from the Council on Foreign Relations, National Security Correspondent David Martin, Homeland Security Correspondent Bob Orr, White House Correspondent Chip Reid and State Department reporter Charles Wolfson. 4:25 p.m. ET The Obama administration has sent a retired senior diplomat to Egypt to press the U.S. case for democratic reforms to top Egyptian officials. The State Department said Monday that the former ambassador to Egypt, Frank Wisner, is now on the ground in Cairo and will be meeting with Egyptian officials to urge them to embrace broad economic and political changes that can pave the way for free and fair elections. State Department spokesman P.J. Crowley said Wisner, who was U.S. ambassador to Egypt from 1986 to 1991, has vast experience in the region as well as close relationships with many Egyptians in and out of government. 3:21 p.m. ET Egyptian Vice President Omar Suleiman tells state television that President Hosni Mubarak emtrusted him to begin talks with all political powers, CBS News' Khaled Wassef reports. Suleiman also said the government will announce several political reforms within days with a priority for fighting unemployment and abolishing corruption. 3:00 p.m. ET State Department spokesman P.J. Crowley said during a press conference that nine flights Monday are taking 1,200 people out of Cairo. 2:41 p.m. ET The White House says the Obama administration has had no contact with the Muslim Brotherhood, the deeply conservative Islamic organization that constitutes the biggest organized opposition group in Egypt, the Associated Press reports. White House spokesman Robert Gibbs told reporters Monday that before dealing with opposition groups the administration would want assurances that they adhere to the law, that they are non-violent and that they are willing to be part of a democratic process. Gibbs said there would be no contact with the Muslim Brotherhood in Egypt unless those assurances were offered. 2:32 p.m. ET The White House is calling for free and fair elections in Egypt, but refusing to say whether the U.S. believes President Hosni Mubarak should run in those contests, the Associated Press reports. White House spokesman Robert Gibbs dismissed Mubarak's move on Monday to appoint a new government, saying the situation in Egypt calls for action, not appointments. Gibbs also says the U.S. embassy in Cairo has not been in contact with opposition leader Mohamed ElBaradei this week. Egypt's government put ElBaradei on house arrest after he returned to the country amid the protests. 2:23 p.m. ET Arab League Secretary-General Amr Moussa called for a peaceful transfer of power in Egypt on Al-Jazeera television, CBS News' Khaled Wassef reports. 2:18 p.m. ET CBSNews.com's Political Hotsheet blog put together a slideshow of Egyptian leader Hosni Mubarak with U.S. presidents and other national leaders during the last 30 years. 2:10 p.m. ET Brent crude oil topped $100 for the first time since 2008 as investors kept an anxious eye on Egypt and worried about unrest there disrupting the flow of oil from the Middle East, the Associated Press reports. Brent is the benchmark for oil prices in Europe and Asia. The price of West Texas Intermediate, the benchmark in the U.S., rose $1.46 to $90.80 a barrel in midday trading on the New York Mercantile Exchange. While Egypt is not a major oil-producing country, each day almost two million barrels of oil pass through the Suez Canal, which is controlled by Egypt. The Suez remains open and shipping has not been interrupted. "Those watching it closely do not believe it is terribly likely to happen soon or at all, but recognize the possibility that it could occur," energy consultants Cameron Hanover said. Oil prices also got a boost from positive U.S. economic news and rising stock markets. The Commerce Department said that consumer spending rose sharply in December, and purchases for the whole year increased at the fastest pace in three years. 1:53 p.m. ET Omar Sharif, Egypt's most famous actor, told the Associated Press he's concerned for the future of his country. "They want the president to step down. This is the first thing. After that, they do not know what they want," he told the AP on Monday. "I personally don't know what they will do afterwards. Who will they bring, who will take his place, who will be in charge of the country?" 1:27 p.m. ET CBS News National Security Correspondent David Martin reports that about two dozen Marines, in what's called a Fleet Anti-Terrorism Security Team, went into Egypt Monday morning to beef up the Marine Corps' detachment at the U.S. embassy in Cairo. 1:19 p.m. ET The Egyptian army issued a statement to Al-Arabiya television that it recognizes the legitimacy of the protesters' demands, CBS News' Khaled Wassef reports. 1:14 p.m. ET The Egyptian army has told television networks Al-Arabiya and Al-Jazeera it would not use violence against the public, CBS News' Khaled Wassef reports. 1:02 p.m. ET Obama administration officials tell the Associated Press the United States is pressing Hosni Mubarak to institute a set of key reforms in Egypt. The most significant is credible presidential elections in September, preferably without the 82-year-old leader as a candidate. Two American officials say the other gestures the U.S. is seeking are for Mubarak to lift emergency laws in place since 1981, allow non-governmental organizations to operate and free political prisoners. The officials spoke on condition of anonymity because of the sensitivity of diplomacy and the difficult situation the Obama administration finds itself in. It is trying to usher in an orderly transition to democracy without alienating pro-democracy protesters or its ally over three decades. 12:49 p.m. ET CBS News' George Baghdadi reports on what Egypt's protests mean to its minority Orthodox Christian community. 12:44 p.m. ET GlobalPost published an analysis of the differences between U.S. foreign policy in Egypt and in Afghanistan as that wartorn country convenes a new parliament amid allegations of rampant voter fraud. 11:14 a.m. ET: Thousands of protesters continue to flout the curfew in Cairo, which began three hours ago (3 p.m. in Cairo, 8 a.m. ET). The crowd in Cairo's Tahrir Square was swelling in anticipation of a massive protest planned for Tuesday. Al Jazeera reports that the Egyptian military is using cranes to install heavy concrete barriers around the square, the focal point of the weeks' demonstrations. Meanwhile, with much of the city not functioning normally, food shortages are plaguing Cairo, with prices spiking and hours-long lines forming for basics like bread and vegetables. 10:55 a.m. ET: Israeli President Shimon Peres expressed "great respect" for Egyptian President Hosni Mubarak at a ceremony for an incoming ambassador Tuesday, the Jerusalem Post reports. "We always have had and will have great respect for President Mubarak. Not everything he did was right, but he did do one thing for which all of us are thankful. He was the peace keeper of the Middle East," Peres is quoted as saying. Peres and Mubarak have a long diplomatic history; Peres is seen in Israel as a moderate who has generally favored compromise with the Arab world. "Acknowledging that Mubarak had not always taken an ideal course, Peres, alluding to the riots in Egypt and the current regime in Iran, declared 'a fanatic religious oligarch is not better than lack of democracy,'" the newspaper reported. 10:29 a.m. ET: Egypt's Muslim Brotherhood has played an important - but somewhat conflicted - role in the anti-government protests. The fundamentalist organization was slow to join in the anti-establishment movement, but when it did so, particularly in the coastal city of Alexandria, its members carried out some of the largest and fiercest protests. "Still, though it can bring out the sheer numbers, the Brotherhood is reluctant to present itself overtly as a leader or driving force in the protests, realizing that storming out with its hard-line slogans of 'Islam is the solution' would disillusion secular groups, raise panic that it is trying to take over and bring a harsher government crackdown," the Associated Press reports. Read more. 10:19 a.m. ET: A spokesman for the U.S. embassy in Cyprus confirmed Monday that a military plane inbound from Egypt with 42 people on board had landed in Cyprus. The 42 passengers are believed to be Americans, mostly U.S. diplomatic employees who were in Egypt attending a conference. The spokesman said the embassy is still awaiting a second plane with approximately 180 passengers on board, believed to be mainly Americans. Meanwhile, Egypt's state television said Monday that EgyptAir flights were suspended from 5 p.m. Monday until 10 a.m. Tuesday in Cairo (10 a.m. Monday-3 a.m. Tuesday ET) - compounding the chaos at Cairo's international airport as foreigners try to flee the country. 10:03 a.m. ET: Egyptian troops are in the Sinai Peninsula for the first time in more than 30 years. Israeli officials say they agreed to allow Egypt to move several hundred troops into the area for the first time since the countries' 1979 peace treaty. Under the treaty, Israel returned the captured Sinai to Egypt. In return, Egypt agreed to leave the area demilitarized. Israeli sources say the Egyptian army will move two battalions - about 800 soldiers - to the area around the southern resort town of Sharm el-Sheikh, relatively far from Israeli territory. Israel's Haaretz newspaper speculated Sunday that Hosni Mubarak had himself fled to Sharm el-Sheikh amid the rioting in Cairo, but that report could not be confirmed. 9:47 a.m. ET: CBS News' Khaled Wassef reports that the Saudi-owned Al-Arabiya network has "noticeably toned down" its coverage of the Egypt crisis - changing an onscreen headline from "The Anger Revolution" to "Egypt... the Crisis" and bringing its coverage more in line with that of Egyptian state television. Al-Arabiya is also focusing more screen time on interviews with people speaking favorably about the new cabinet and reports that the security situation in Egypt is rapidly improving, Wassef reports. 9:38 a.m. ET: Al Jazeera tweets that six correspondents held by Egyptian authorities have been released, but that the authorities confiscated the journalists' production equipment, including cameras and tapes. On its website, an Al Jazeera spokesman said that the station is disappointed in Egypt's crackdown, including cutting off Al Jazeera's satellite signal there. "If anything, our resolve to get the story has increased," the spokesman said. 8:21 a.m. ET: State television reports the railway suspensions are now nationwide. 8:05 a.m. ET: Train service into and out of Cairo has been suspended after reports that protesters from other cities are preparing to head to the capital for Tuesday's planned million-person march, according to state television. Among notable changes, the Interior minister who also is in charge of internal security forces, was replaced with a retired police general, Mahmoud Wagdi. His predecessor, Habib el-Adly, was known for brutal police tactics, reports the Associated Press. 7:52 a.m. ET: According to Al Jazeera, there were still more than 100,000 protesters in Tahrir Square ahead of Monday's 3 p.m. (local time) curfew. There were protests also reported in the elite neighborhoods of Dokki and Maadi. 7:30 a.m. ET: Jamie Rubin, former State Department spokesman during the Clinton administration, shared some thoughts on Egypt during an appearance on "The Early Show" this morning. "I think they're at the right place now. But it's taken them awhile to get there. A week ago, they were talking about how Egypt's government under Mubarak was stable. So they've gotten to the right place. I think now, the message clearly is to have a speedy transition. And it's not going to be that hard if President Mubarak gets the message." "Well, I think the crucial conversations are those that have been organized between the [U.S.] Joint Chiefs of Staff and the military in Egypt. We have very close ties to the Egyptian military. They train with us. We've been arming them and working with them for three decades. I think it's those messages that are crucial. One, telling the military that all bets are off if they use massive force against the protesters. But, two, making clear that something's got to give quickly. And then I think finally, time may come in the next day or two when the [Obama] administration realizes it needs to send an envoy to privately meet with Mubarak, lay out a much tougher set of requests [or] recommendations, and get him to finally make the announcement that he's leaving." "Oh, I think the military will decide the direction of the country. First they'll decide whether or not they will carry out any order to use force, if that comes. And, two, I think they can signal to President Mubarak that he's lost their support. Now yesterday, he seems to have it at the top levels: F-16 fighters, the helicopters, the generals meeting with him. But on the streets, he doesn't seem to have it. And so, as goes the Egyptian military, so goes the speed of this change. Not the result of it, but the speed of it." "I know him very well. Secretary [Madeleine] Albright who I worked for was the one who approved his selection as head of the U.N. watchdog, the IAEA, and my wife and I have known him for years. He's a very modest, moderate man. He's not a natural politician. I think on TV yesterday, he used the word 'oxymoron,' which is not exactly what populist leaders would say. But I do think it's possible that he could be a compromise candidate as a transitional figure. [He] has the support of all sides, so that they can negotiate. What's crucial is enough time before the next election. If they ran it too quickly, the only organized force outside the ruling party is the Muslim brotherhood, and we don't want them to have a leg up." 6:57 a.m. ET: Egypt's bond rating was cut by Moody's, which also lowered the country's outlook to negative amid weeklong protests and political unrest, the Associated Press reports. Moody's is at least the second international ratings agency to take that step. Fitch likewise lowered Egypt's outlook to negative. 5:14 a.m. ET: Evacuations of foreign nationals seeking to put Egypt's political unrest behind them ramped up Monday, with the first chartered plane carrying U.S. citizens out of Cairo headed for Cyprus and jets from China on the way to pick up hundreds of worried Chinese. 3:38 a.m. ET: Thousands of Egyptian protesters camped out in Cairo's central Tahrir Square to awake Monday morning for a 7th day of popular revolt against President Hosni Mubarak's three-decade rule. Seeking to maintain the anti-Mubarak momentum, a lead opposition group is calling for a million people to fill Cairo's streets on Tuesday in a massive show of support. Multiple reports say the April 6 Movement, a youth opposition group formed in 2008 with a strong presence online, has called for the "mega protest". The BBC also reports that many protest organizers have called for a general strike across the country on Monday in protest of Mubarak's refusal to leave office. It's unclear how well coordinated Egypt's various opposition factions are, or whether the call for a mass strike on Monday or a mass protest on Tuesday will be widely heeded. The only prominent figure to emerge as a leader of the anti-government movement has been former international diplomat Mohamed ElBaradei, who told a crowd in Tahrir Square on Sunday night that 85 million people were demanding Mubarak's ouster. 3:15 a.m. ET: Pan-Arab broadcaster Al-Jazeera continues to defy the Egyptian government's attempts to silence the network's coverage of chaos in the country, but with its Cairo offices closed, the network is reaching out to its own viewers to provide insight into the tumult. A statement by the network urges Egyptians to send blog posts, eyewitness accounts and videos to "further enhance its coverage of the unfolding events" surrounding the uprising against President Hosni Mubarak.